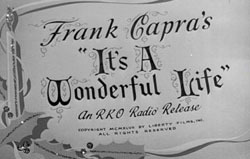 Try your hand at these trivia questions about Frank Capra's It's A Wonderful Life. After you guess, you can see how you did by watching It's A Wonderful Life here on XmasFun.com. "Strange, isn't it? Each man's life touches so many other lives. When he isn't around he leaves an awful hole, doesn't he?" What is the name of the stumbling, bumbling, but very lovable angel who helps George realize what a wonderful life he has? What is the name of the city where this story takes place? "I wish I had a million dollars!" What two words follows this George Bailey quote twice in the film? How much does Violet spend on licorice? 2 cents. "Two cents worth of shoelaces?" Which president's picture hangs in George Bailey's living room after the money was lost? What is the name of the book that Clarence is reading in the beginning of the movie? What does George pile high on Mary's sundae even though she says she doesn't like it? Uncle Billy lost it at the bank. The envelope containing the money got wrapped up in a newspaper which Uncle Billy left with Mr. Potter. Where is Mary working when George tries to find her after Clarance changes everything? What does it mean when a bell rings? An angel gets his wings!